A burglar arrested by the operatives of the Rapid Response Squad (RRS) of Lagos State Police Command, has disclosed that he pays N240, 000.00 monthly to service his hotel bills. 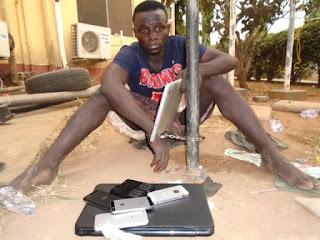 Joseph David, 20, from Ekpoma, Edo State, was arrested in Ikeja at about 4:40 a.m. after he had successfully burgled two flats in Gbajobi Street, Balogun, Ikeja, where he stole three laptops and five mobile phones. David was on his way to the hotel (name withheld) located in Dopemu, where he has been lodging for over one month when he was intercepted by the police. David made a confessional statement to the police, saying that he has been lodging in hotels because he could not live in his parents’ house as a result of the poverty stricken condition of the environment. He added that each night he spent in the hotel was N8, 000, noting that he has spent over a month living in the hotel. “I was returning to the hotel when I was accosted on Awolowo Way by RRS operatives and they stopped to check my bag. They found: 1 Mac laptop; two HP laptops, two iPhone 5; one blackberry classic and two Nokia Touch phones. “The house I broke into is a two storey building behind Jabita Hotel in Balogun, Ikeja. I scaled its fence around 3:00 a.m and I finished the operation around 4:00 a.m. I have broken into some other houses in that area before, where I stole handsets and laptops. I am into ‘yahoo yahoo’ but money has not been forthcoming like before. I could barely make N100, 000 and N50, 000 like before. That is why I used break in and steal to augment my earning”, he confessed. “I stay in the hotel with my girlfriend and a couple of friends come around. Benjamin is the only buyer that I have. I have been an embarrassment to my parents”. “I buy phones and laptops from him. I used to visit him in whatever hotel he lodged in to buy the stolen items”.